Dennis Báthory-Kitsz: Sultry Nights. Recording provided by the composer. David Gunn: Redoubt. 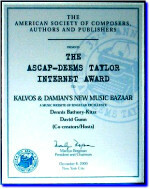 Lydia Busler-Blais, David Gunn, Dennis Báthory-Kitsz, voices. Live performance on Live and Unhinged! Dennis Báthory-Kitsz: i cried in the sun aïda. Beth Griffith, Lydia Busler-Blais, David Gunn, Dennis Báthory-Kitsz, voices. Live performance on Live and Unhinged! K&D Show ID by many composers. Dennis Báthory-Kitsz: The Warbler's Garden. Recording provided by the composer. David Gunn: Lois. Recording provided by the composer. David Gunn: Forbidden Flute. Jacqueline Martelle, flute; Joseph Kubera, piano. Live performance on Live and Unhinged! K&D Show ID by Brenda Hutchinson. David Gunn: Best of the Bazaar Mark LXXXIV. Dennis Báthory-Kitsz: Sweet Ovals. Lydia Busler-Blais, French horn. Live performance on Live and Unhinged! Dennis Báthory-Kitsz: Spammung. The composer, voice. Live performance on Live and Unhinged! K&D Show ID by Thomas Buckner. David Gunn: Utopiano. Joseph Kubera, piano. Live performance on Live and Unhinged! Kalvos & Damian: The Wind-Up Wagner Doll.